Here goes the another one..
Click here to check out previous one. Anyways, Here is the new one. Can you find the ? in the below figure. 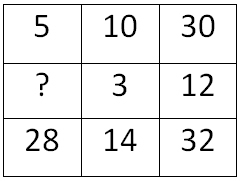 Consider the given numbers as a series of numbers rather than trying out combinations on its look. yup congo have you checked the other one..